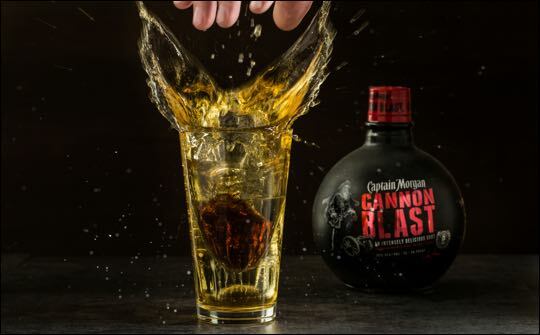 Diageo is targeting the shots category with the launch of Captain Morgan Cannon Blast – a new sweet and citrus spiced rum. The cannon ball-shaped glass bottle with screw cap has a textured, cannon-ball-like rough matt black finish on the full-body sleeve, which is over-printed with a chalky white scull and cross bones on one side and Captain Morgan on the other. Captain Morgan is highlighted in glossy black and white spot varnish and the branding uses a metallic red and white. The bottle sleeve is printed using UV reactive inks so that the bottle with glow under black light. The rum is described as "an intensely delicious new shot - a Caribbean rum with spice and natural flavours". Available in 50ml, 75cl and 1-litre bottles, it is 70 proof/35%abv and has a RRP of US$15.99 for a 75cl bottle.